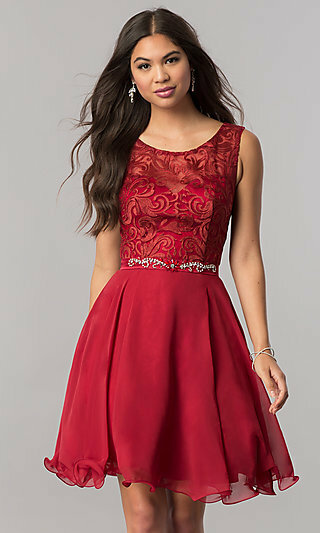 PromGirl has an amazing collection of dresses for all the members of your Quinceañera Court of Honor. The quinceañera traditionally wears a ball gown, while her damas can wear long formal dresses or short party dresses. What girl doesn’t want to glammed up?This may be your big day, but you want to make sure your BFF’s look amazing too. There are cheap dama dresses or designer party dresses in a multitude of styles that can fit every shape and budget. Choose between strapless short dresses, elegant high-low dresses, one shoulder party dresses and short off-the-shoulder dresses. Pick from sequin dresses, sparkling beaded dresses and modern babydoll dresses in bright bold colors or soft pastels. 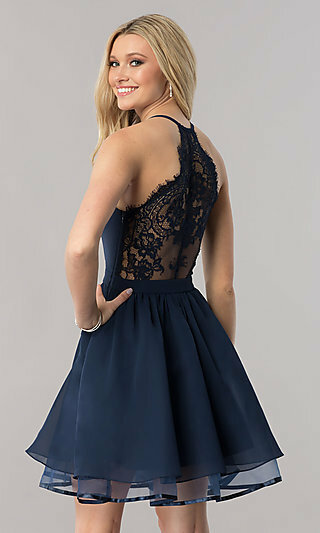 Once you decide the color and length you are looking for, shop PromGirl for the best price dama dresses in all of the most popular colors and styles. Who Is In The Quinceanera Court? The Quinceanera Court of Honor is composed of damas (and chambelanes) who have a close relationship with the quince: family members and friends. The court can be all girls or a combination of young ladies and young men. The beautiful thing about a modern day Quinceanera is that you can adapt it to fit your budget, style or family tradition. Whatever your style, PromGirl has a large selection of dama dresses to choose from. Extra cute layered tulle skirts or tiered ruffle skirts with standout details like sequins and beaded bodices fit the traditional dama look. For a more modern look, why not try some trendy styles for your dama dresses? Asymmetric hems, high-low hems and short bandage style sheaths are becoming popular choices for Quinceanera Court dresses. Perhaps a two-piece dress featuring an embellished bodice with either a long chiffon skirt or a twirl-worthy short skirt will suit your vision. At PromGirl you will find perfectly affordable dresses for your damas that look expensive but are easy on any budget. Our large selection of damas dresses includes cheap short dresses and cheap long dresses to ensure your court doesn’t have to spend a lot of money to look amazing at your Quince. Available in an array of colors from soft pastels to bright colors and bold prints you are sure to find dama dresses that fit the color theme of your special event. 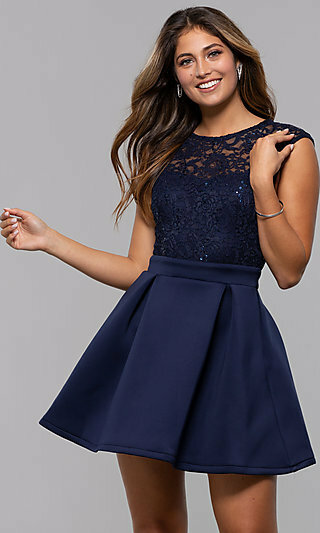 Still can’t decide what dama dress is right for your Quinceanera Court of Honor? Our style consultants will be thrilled to assist you with any questions you may have about selecting the perfect dama dresses for your Court of Honor.